The Russas and Valparaiso Projects involve numerous local and international partners that will collectively protect more than 170,000 acres in the Amazon Rainforest – the world’s largest rainforest – from slash-and-burn forest clearing and prevent millions of tonnes of greenhouse gas emissions. Avoided deforestation projects are critical because about 11-14 percent of all global warming is attributed to deforestation, which reduces the Earth’s capacity to absorb carbon dioxide. Moreover, fallen trees decompose and release methane, a heat-trapping gas about 25 times more potent than CO2. 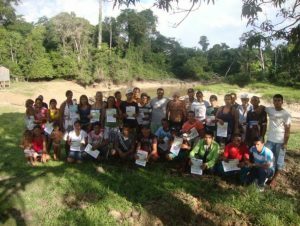 The Russas and Valparaiso Projects were successfully validated to the Verified Carbon Standard (VCS) and the Climate, Community & Biodiversity Standard (CCBS) with Gold Distinction for exceptional community benefits in March and July 2014. The Projects’ first verification was successfully achieved in December 2014 and the Projects’ second verification was successfully achieved in November 2017. Both Projects are now being reviewed for their third verification to the VCS and CCBS to assess the Projects’ performance from January 1, 2017 to December 31, 2017. The Public Comment Period for the Russas and Valparaiso Projects runs from October 5th to November 4th, 2018. Reformed the local school near the Projects’ headquarters. The Russas and Valparaiso Projects will also provide a variety of essential ecosystem services such as: erosion and flood control; water cycling, filtration and storage; oxygen production and nutrient recycling; genetic repository for medicinal plants; and habitat for thousands of native Amazonian animal (including scarlet macaws and Amazon River dolphins) and plant species. Global Warming: Leadership Needed in Advance of Dec.